Distributes incoming video signals for up to 4 television outlets and supports up to 6 telephone outlets with up to 4 lines. Surface mount design is ideal for retrofit applications. 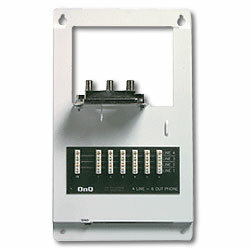 OnQProducts.com, an online retailer of Legrand products, is a leading provider of cable management equipments. We specialize in home, telecom and network modules. All orders, small or large, are welcomed with no minimum order requirements.